A team of "terrorist operatives" planned to attack the New York City subway on Sunday with remote-controlled bombs, a leaked FBI document warned. The attackers may have planned to hide explosives in briefcases or pushchairs, a copy of the warning obtained by the Reuters news agency revealed. But the bulletin said officials had doubts about the threat's credibility. New York City Mayor Michael Bloomberg put the city on high alert over the threat earlier this week. He has been defending his decision, after White House spokesman Scott McClellan said the threat was "of doubtful credibility". The mayor received the memo from the Federal Bureau of Investigations (FBI) and the Department of Homeland Security on Thursday, the same day he announced the existence of the threat in a press conference. The document, details of which were first published in the New York Daily News, said officials doubted the threat but passed the information along "to provide increased awareness out of an abundance of caution". The alert was raised by an informant who said there was an operation involving more than a dozen operatives in Iraq and the US. Acting on the information, US and Iraq forces in Iraq have made at least two arrests. On Saturday, Mr Bloomberg said he felt confident he had taken the right decision to alert the public and increase security measures. "We've over the last couple of days become more convinced that the threat was real," he said. 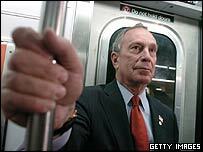 President George W Bush defended Mr Bloomberg, saying he would not second-guess the mayor's move. 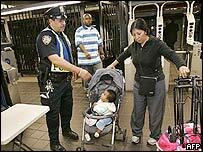 An estimated 4.5 million people use the New York City subway every weekday. Have you been affected by the increased security measures? Send us your comments and experiences on the form below.